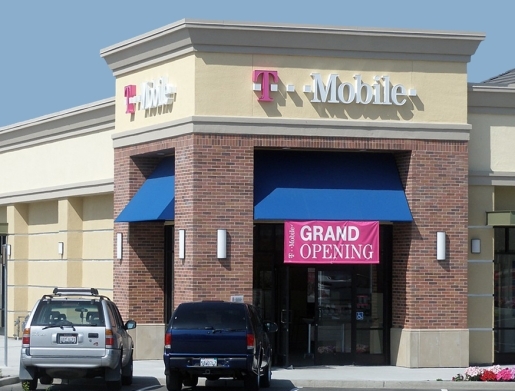 A possible site for an AT&T-Mobile store? The trend among industries is consolidation. Bigger might not always be better, but bigger has less trouble surviving, and in this economy survival is pretty much all you can hope for. Even the cellphone industry is contracting, and the big spenders are looking to improve their market position. For example, AT&T has lost the iPhone that propelled its business, so they’re going to go big in an attempt to avoid going home. AT&T is going to buy T-Mobile USA from Deutsche Telekom AG for a staggering $39 billion dollars. The proposed merger would give the new AT&T 43% of the US market, making it the largest cellphone company in the United States, supplanting Verizon Wireless. Of course, the deal is not without drawbacks, as consumer rights groups are complaining that it’d put too much cellphone power in the hands of a single company. Then again, you’re dealing with T-Mobile, who tried to own the color magenta, and AT&T, the worst-rated cellphone company in the US. Is this massive edifice really a threat to Verizon, even with superior numbers? AT&T is looking to sell off some of T-Mobile’s assets in a bid to push the merger through regulators. Approval of the deal is expected to take place within the next 12 months.